Maybe you thought all there was to order from street-side vendors in Beijing were the oddities, like the scorpions and starfish at Wangfujing snack street. 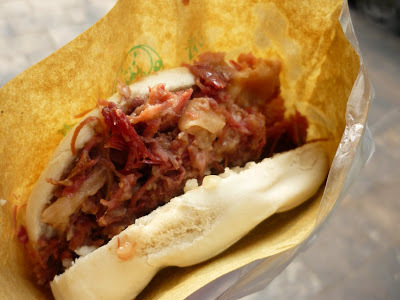 Thankfully, you would be wrong; there’s a world of delicious street snacks to be found in Beijing (and other cities in China,) that you shouldn’t wait to explore! Summer interns, Hannah, Olivia, Shirley and Kamilla, give you the scoop on eight must-try street snacks in Beijing. These foods will always be one of our favorite memories, and something we will definitely miss after returning home. They’re cheap, found in almost every corner of the city, and satisfy every kind of craving. Read on below and don’t be surprised if your stomach starts growling. Olivia: Lighter than normal yogurt, suannai is a great refreshing drink on a hot day. Shirley: Sometimes I have a feeling I should try it, but then I think, hmm, better not. Kamilla: I was hesitant to try at first, but it turned out to be a delicious and refreshing snack! Now I understand why I see them everywhere. 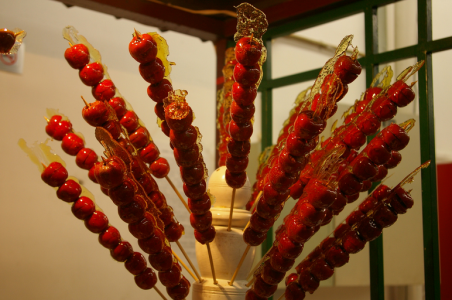 Traditionally, tanghulu is made by putting hawthorns on a stick and dipping them in sugar syrup. The sugary shell resembles ice, giving it’s name “iced candied hawthorn.” Small sour fruits, hawthorns bring a contrast to the sweet coating. Other fruits are often candied to make tanghulu, such as strawberries, mandarin oranges, and pineapples. Hannah: I am personally not a fan of this hard, sugary mess, though apparently I am an anomaly. The candied part feels like shards of glass making it difficult for me to enjoy. I like foods that don’t threaten me. Olivia: Bingtanghulu are great but very sweet, make sure you are sharing a skewer with a friend or two to avoid a sugar rush. Shirley: Last time I had tanghulu there was a candied cherry tomato on it…apparently tomatoes are fruits too. But despite the experimental nature of some tanghulu makers, these are actually quite good. They remind me of carnival food, super sweet and perfect to share. Kamilla: Messy to eat but so worth it. Like candy apples but cuter. 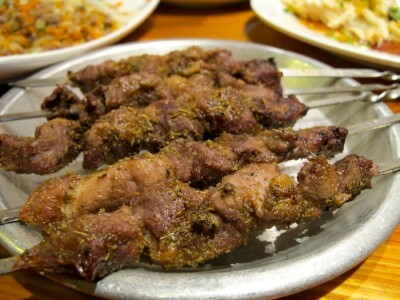 These thin skewers of meat and sometimes veggies are probably the most widely available snack food in Beijing. Although it receives praise from 老外 (laowai, foreigners) for being an amazing midnight snack, many locals enjoy this food regularly. This snack is typically spiced with a combination of cumin, sesame, and pepper flakes and then cooked on make-shift grills on the side of the street or in small, hole-in-the-wall restaurants. Hannah: Just like you smell freshly baked chocolate chip cookies a mile away, you can smell chuar a kilometer away. Ok maybe not a kilometer but definitely down the hutong. This is a food that smells just as good at is tastes, so that’s a win-win. Olivia: Chuanr are a great snack because you can choose exactly how much food you want to eat and know what you’re ordering. Shirley: You never really know what you’re eating when it comes to chuanr…but for one kuai, who cares? Kamilla: I am tempted every time I smell the combination of charcoal, cumin, pepper walking down the street. Youtiao is a Chinese spin on doughnuts: this snack is a long, twisted fried dough that is usually enjoyed with a cup of hot soy milk. Unlike doughnuts though, sugar is an opt-in feature. Chinese McDonald’s branches have adopted this as local food and sell it alongside breakfast sandwiches. Hannah: Youtiao is a treat. Though it has zero nutritional benefit, that never stops me from ordering it, or it’s brother Youbing, the flat version, or my favorite sibling of all, tangyoubing, the sugary flat version of the youtiao. Easily 5 out of 5 stars, and there’s no chance you’ll get a bad one. It’s impossible. 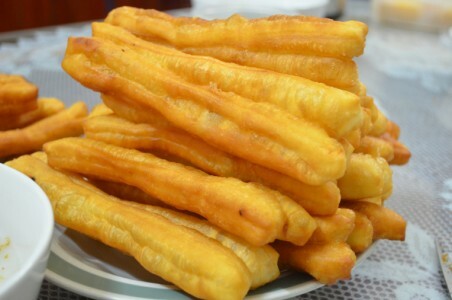 Olivia: Crunchy on the outside, chewy on the inside, youtiao are satisfying any morning. Shirley: Not a huge fan of oily breakfasts…but it’s probably good hangover food ;). Baozi are stuffed steamed buns, a classic grab-and-go meal. They are a great filling snack, usually consisting of a meat in heavy white bread. 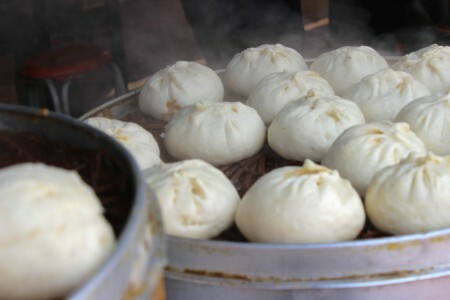 Bamboo steamers full of baozi can be seen on the streets, piled high with buns made fresh to order. Hannah: Baozi, like people, are diverse. The stuffing can cater to the omnivorous type like me! I can choose from chives and egg, to fennel and egg, to mushroom and carrot. Any xia’r you imagine, probably exists. And for the meat lovers, pork stuffings with different vegetables are the most popular. There’s nothing like biting into a pipin’ hot baozi any time, day or night. 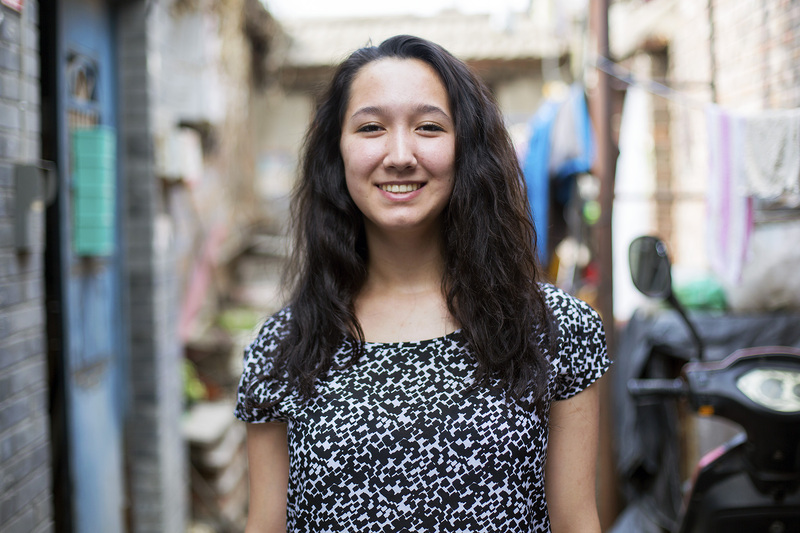 Olivia: Baozi are so ubiquitous in Beijing that I never crave them because I see them everywhere. The meat filling, while delicious, is something I’ve smelled so often that I try to avoid it. Shirley: Perfect to warm you up and fill you up during the colder months! Kamilla: These fill you up fast! My favorite baozi are the ones filled with lamb and Chinese chives. Jianbing has to be the ultimate Chinese breakfast. Bing booths are found on almost any street, most busy in the early mornings. 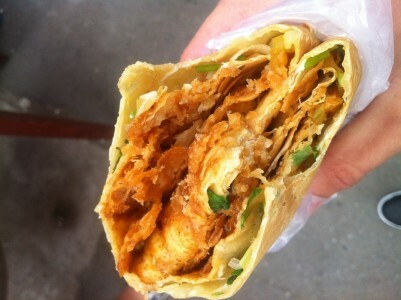 It is made from a crepe base fried with an egg on a circular flat grill, and filled with scallions and flavorful sauces. The jianbing has also made it to San Francisco and Portland, and even this year’s Met Gala. Hannah: Safe to say I have this about 3-4 mornings a week for breakfast and I still crave it. It’s hearty, though it slacks on the greens, there’s some cilantro in there. Olivia: Jianbing is my favorite street food! Warm, hearty, simple, and served in a large portion, it is filling without feeling too indulgent. Shirley: I’m almost always in the mood for bing — breakfast, lunch, and dinner. Check out its cousin, the shou zhua bing, too! Also known as a Chinese Hamburger, Roujiamo is stewed meat stuffed in a pita bun. The flavors of your roujiamo will depend on the vendor, as each use their own spiced mix, drizzle and preparation styles. Most commonly the meat is stewed with spices such as chili, cumin, and mouth-numbing Sichuan pepper. Hannah: Just stick with the American version. Olivia: Roujiamo is a competitor to the hamburger, with pork instead of beef, it’s the perfect solution to a craving for meat on the go. 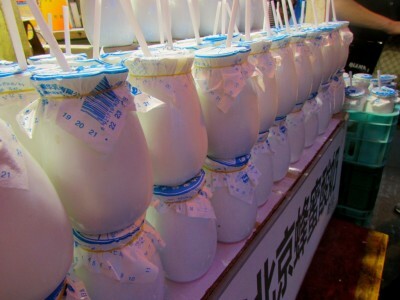 Beibingyang is as ubiquitous in Beijing as Cola and Fanta. This orange soda drink differentiates itself from others with its “ultra-low” sugar content. 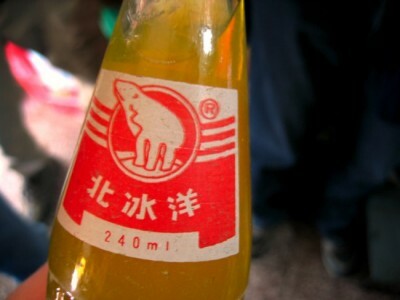 The polar bear was put on hiatus after Beibingyang Co. started a joint venture with Pepsi in 1994, but in 2011 the brand made a comeback and can be found in almost any convenience store or restaurant. Hannah: This toned down version of diabetes inducing Fanta has the perfect ratio of bubbles to gulp. While drinking an ice-cold Beibingyang in its slim, glass bottle, you can’t help but feel 100% satisfied. 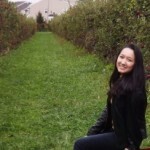 Olivia: Chinese food is best when spicy and oily, making refreshing drinks like beibingyang a necessity. Shirley: Perfect for a hot, summer Beijing day! Kamilla: After trying this, “low sugar content” are my favorite three words when it comes to soda. What snack foods were missing from this list? 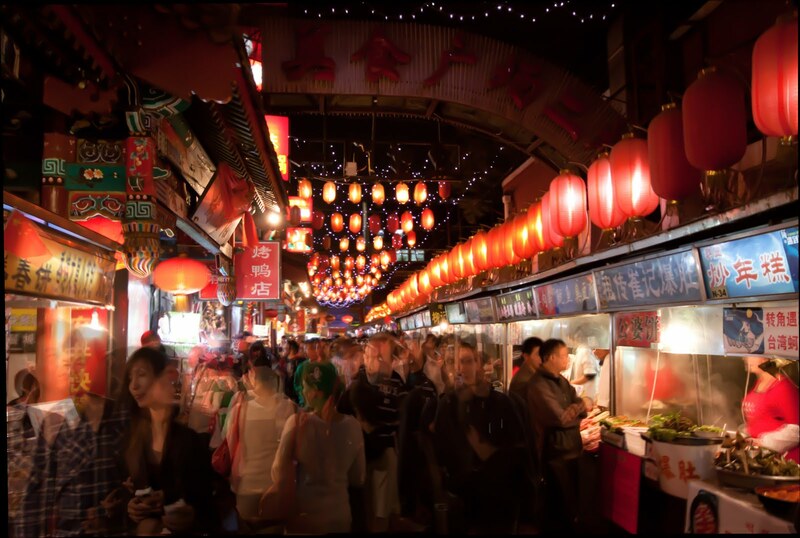 Leave a comment and tell us what your favorite Beijing street food is!